Explore Himachal Pradesh – The "Land of Gods"
Himachal Pradesh is one of the most popular and charming travel destination in North India and is also known as the “Land of Gods”. Himachal Pradesh is surrounded by the Himalayas, Punjab, Kashmir and Tibetan Plateau, which gives a unique geographical beauty for this place. Himachal Pradesh is considered to be an an ideal place to visit and the presence of hill stations, waterfalls, thick Deodar forest, valleys and apple orchards makes this place more special. The beautiful rivers and lakes of Himachal Pradesh is sure to leave you spell bound due to its amazing beauty and grace. Himachal Pradesh is blessed with the present of hill stations such as Shimla and Manali, which are two of the most attractive and famous hill stations in North India. This place is a favorite tourist place for travelers from across the world and also for the domestic travelers. A perfect honeymoon destination in North India, Himachal Pradesh is also well known for its adventure travel destination. Adventure lovers can be seen visiting Himachal Pradesh during the peak tourism season to experience an amazing adventure expedition of their lifetime. Himachal Pradesh is considered to be a paradise on Earth due to the presence of Hindu pilgrimage sites and sacred temples and there are also many legends and myths associated with this holy destination. The incredible views of the snow clad mountains, deep gorges, pristine nature, undulating grassland, lush green valleys, frozen rivers, glaciers, charming lakes and hills are some of the most astonishing things to see in Himachal Pradesh. The sightseeing destinations of Himchal Pradesh also provides an opportunity for adventure activities such as trekking, mountaineering, river rafting, fishing, skiing, ice skating, paragliding, and golf. A state rich in its flora and fauna, Himachal is also home to almost 32 Sanctuaries, 2 National Park and 3 Games Reserve. A trip to Himachal Pradesh is always a memorable one for the tourists and they will be able to get an amazing travel experience they can take back home and share with others. A travel trip to Himachal Pradesh is simply exciting during the rainy season when you can view the flowers blossoming and the valleys turning green. For travelers who want to experience the beauty of Himachal Pradesh during the winter season, the best time is during November to March, when most of the major travel destinations are covered with snow. Two of the major winter and summer tourism destinations of Himachal Pradesh are Shimla and Manali and these destinations are also popular as a perfect honeymoon destination in India. There are also a number of interesting tour destinations in Himachal Pradesh such as the Rohtang Pass, Dharamsala, Kufri, Chail, Solang pass, and Dalhousie. These destinations are sure to provide a surprise and astonishing travel experience due to its amazing pristine natural beauty. This entry was posted in Himachal Pradesh and tagged himachal pradesh, himachal pradesh travel, himachal travel destinations, travel spots in himachal pradesh. Bookmark the permalink. 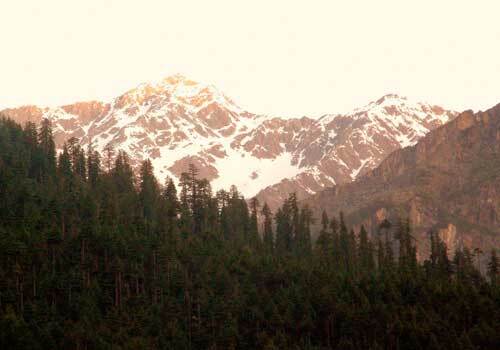 There is no doubt in that Himachal is a “Land of Gods”. Last year we went to shrikahand mahadev it situated in kullu. It is believed that Shrikhand Mahadev is one of the abode of Lord Shiva and the mountain top around 19,000 ft altitude. When we reached at the top we felt some kind of spiritual power over there! Thanks Ishita for commenting on this post. Himachal Pradesh is indeed a travel destination where you can feel the sense of spirituality everywhere.